In 1984, Michael Jackson's hair caught fire through an imprudent combination of hair spray and pyrotechnics. This was just a year after Jackson had released the Thriller video, which co-opted George Romero's cult classic Night of the Living Dead (1968) and evermore installed zombies in pop culture. 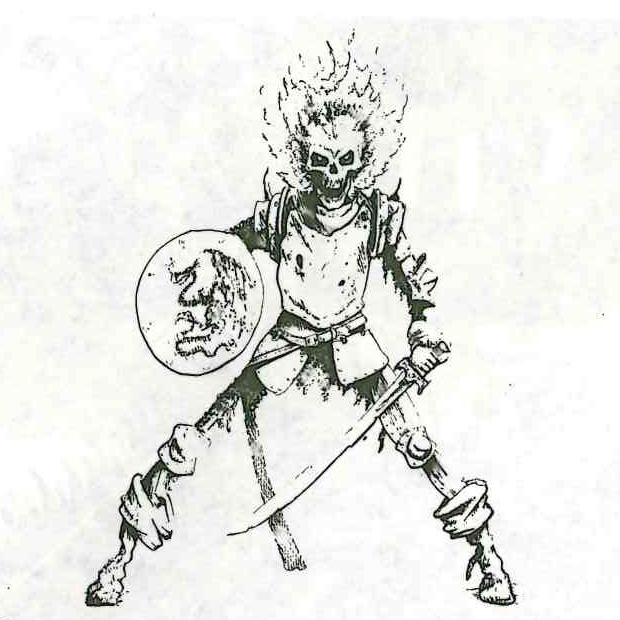 Jackson's fiery accident clearly overwhelmed the sensitive emotions of the Citadel Design Team, and in response they created the miniature Mikael Jacsen, Lord of Zombies. "By [the Lichemaster] hung the stench of decay, the rotting zombie legions and their Lieutenant, Mikeal Jacsen. 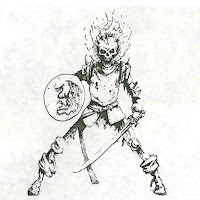 In death, Jacsen was a great dark skeleton, long and thin, and with a skull that burned with an unnatural light, and from in between his huge dead teeth there issued a foul, thin shriek that few could listen to without sickening." Mikael Jacsen is another devilishly rare miniature in the Lichemaster set, being only sold by mail order in the mid-1980's. 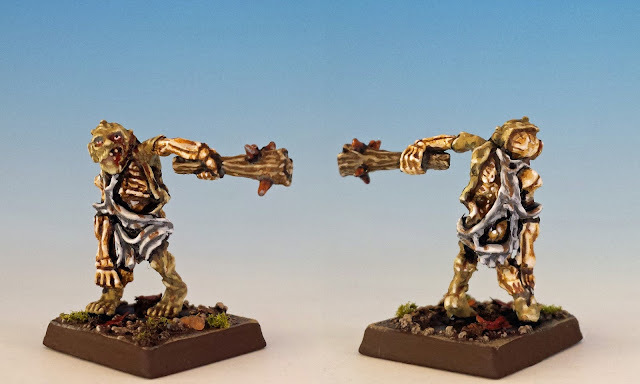 Based on the style of sculpting (big boots, gangly limbs and comic flair) I am confident is ascribing this miniature to Aly Morrison, who sculpted many of the C17 Citadel Skeletons. 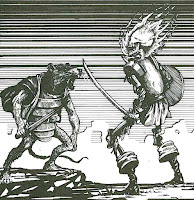 Jacsen's grinning shield is from the vintage range of SH1 Metal Shields released in 1987. Jacsen is accompanied by a pack of 10 zombies. 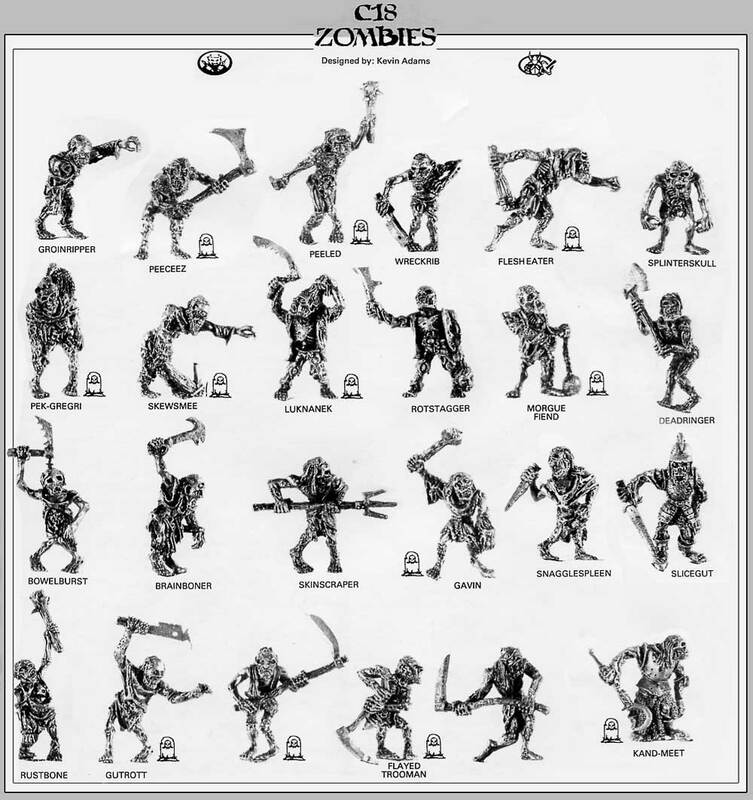 Naturally, I selected most of them from Citadel's C18 Zombies sculpted in 1986 by Kev "Goblinmaster" Adams. 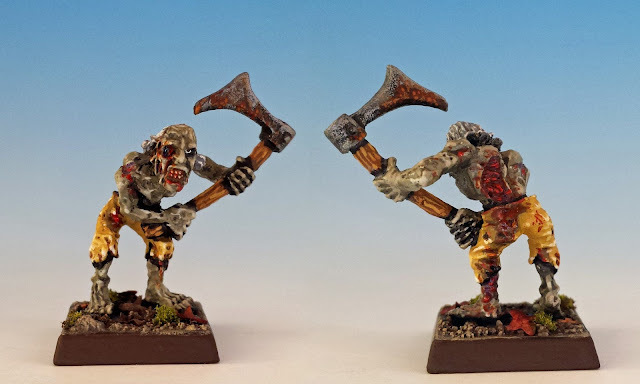 These are some of the best fantasy zombies ever sculpted: by turns they are hilarious, disgusting and scary. 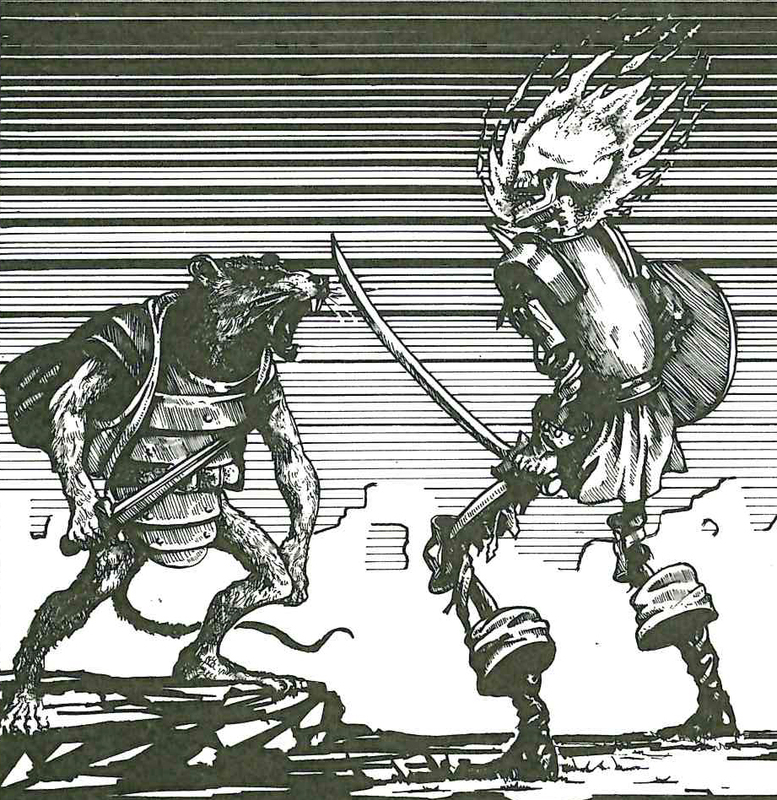 They also have some execrable puns as names (something I think we can blame on Tim Pollard), such as Kand-Meet and Deadringer. 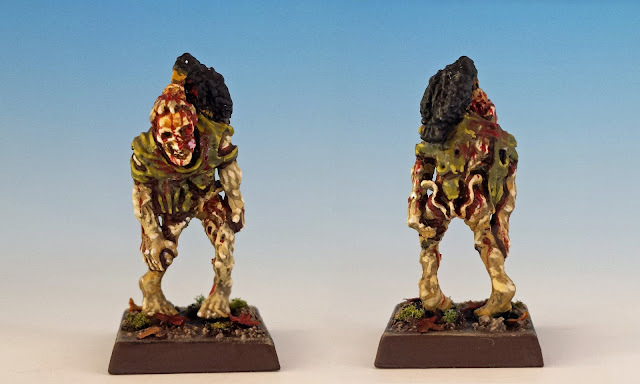 * This beautifully sculpted miniature is sadly without a name in the old Citadel flyers, so I gave him the most Tim Pollard-esque name that I could come up with... Kay-Bob. But nothing will ever beet "Pek-Gregri". Next chapter of my favourite miniatures-internet project of Lichemaster! Wonderful job, they' re terrifying...Love the raven, nice, and of course the 'hair caught fire', most impressive!! Wonderful, all the textures are splendid. 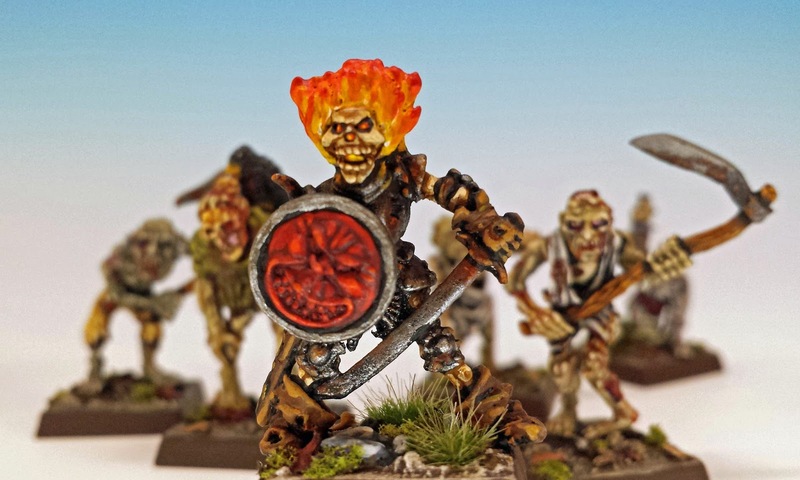 Really nice work; not only the skelly in flames looks gorgeous, the zombies are inspired. I love everything! And I agree the Gregory Peck pun is sublime! Excellent work! 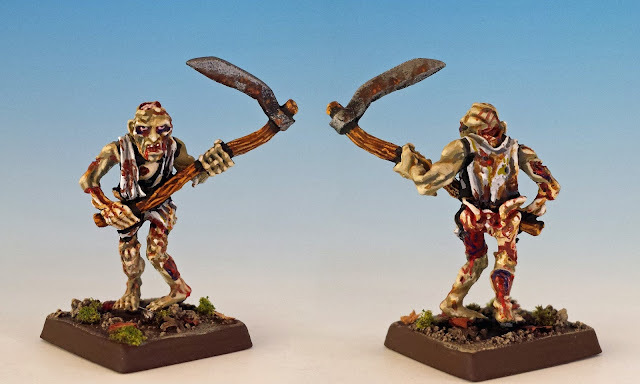 By the way, are you aware that Kev Adams is busy sculpting more zombies in the style of the c18s? I didn't know that! That's very exciting. His zombies are unique -- both menacing and disintegrating before your eyes. I sent you a PM on the forum. 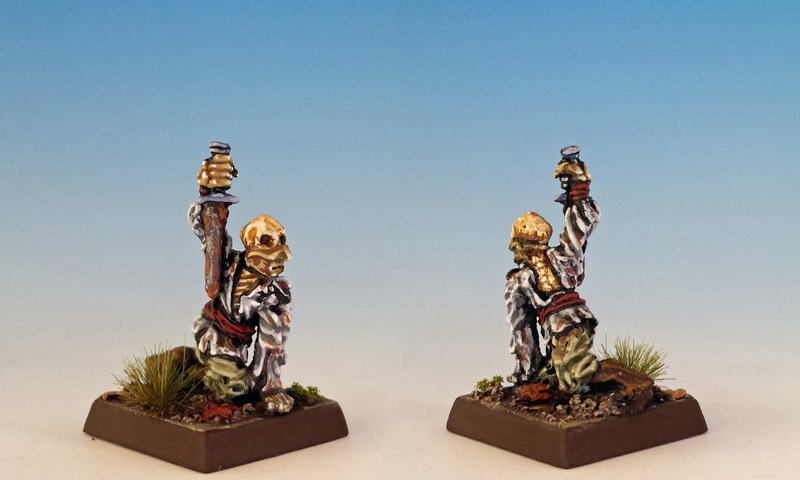 So much character in all these sculpts and your paint jobs are splendid necromancy at it's best; bringing the models to life. Thanks everyone! 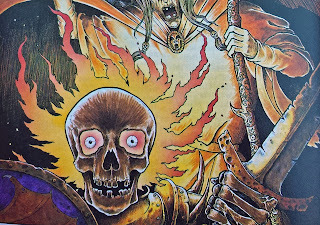 It makes me happy to know that you're enjoying the Lichemaster saga as much as I am. 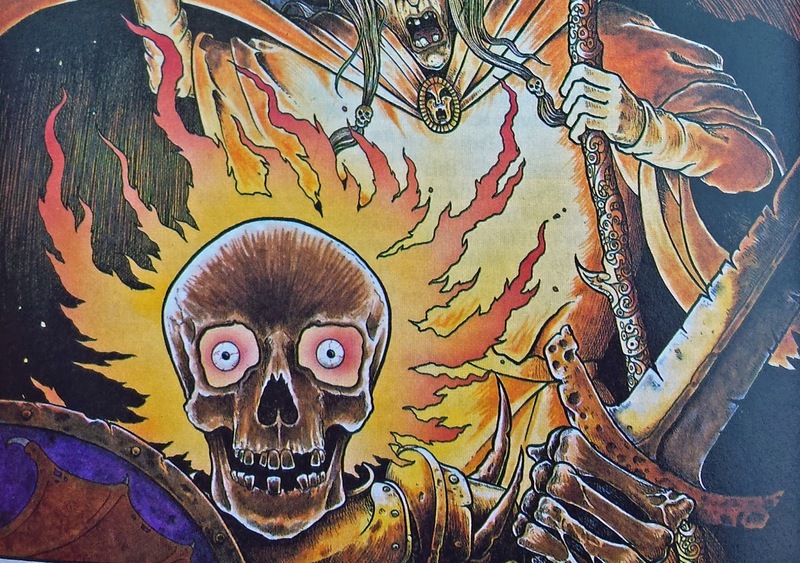 Technically speaking, I like Mikael for his fantastic rusty armour, and the way you put the flames behind his eyes and mouth... something a lesser painter might not have thought to do. Very nice - the Jacsen model is currently sitting on my table. I haven't decided what king of shield to use yet so he's been there for about two weeks. 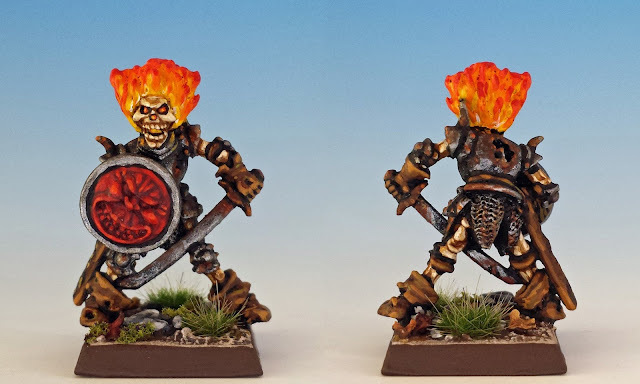 This may be impetus I need to get him painted! I can't wait to see what you do with him... I'm a big fan of your work. I had no idea there was an actual story behind this! Of course I got the reference in the name, but this is just brilliant! As per usual you've done a great job on another wonderful little oddity. Really enjoying watching this project progress. I've been meaning to comment on this in a while. Love the Mikael Jacsen, the way the glow is coming through his mouth and eyes really lets you know that his head's on fire.